I’ve lived in a number of different countries. Not holidayed there. Actually lived there and mingled with the citizens. Its an experience that teaches you a lot of things, but the main one is that people are the same the world over. Every individual just wants a decent life where they can care for and nurture their families. Except there must be exceptions to this rule, for how else can individuals transform themselves into mass murderers and commit genocide as in Hitler’s Germany, Stalin’s Russia, Mao’s China, or Pol Pot’s Cambodia? While reading on Twitter the unbridled hatred that many young (and old) Americans have for Sarah Palin, (subject of an earlier post) it occurred to me I was observing the same kind of attitude (in embryonic form) that was exampled by the Cambodian thug communist soldiers. It was initially a mystery to me, for I was asking myself, how could this intense hatred grow, and how could it be so widespread. It had to be something systematic, but what was that system? Its an issue I hadn’t previously given much thought to. A couple or recent events alerted me to a possible solution. I read Bill Lind’s address on Critical Theory, about the psychological tools the academic left use to make a society hate itself. I thought about this and the recent widespread irrational expressions of hatred for Conservatives that were most apparent after the Arizona shootings. The pieces fell into place. What we are experiencing today in the West is perhaps Phase One of the plan that transforms normal people with normal ambitions and desires into hate driven genocidal maniacs. I can already hear the usual suspects calling extreme lunacy as usual, but I challenge anyone to provide any explanation for the widespread and systematic hatred that is on display in American society towards Conservatives, and is especially intense towards Conservative women (Michelle Bachmann, Sarah Palin for example) or Conservative blacks, or Christian Conservatives. There absolutely has to be a political force behind it. And that force is energised by the left. By the Progressives. By the cultural Marxists. Mostly by means of their Critical Theory, where everything about the west is criticised as bad (usually on completely false grounds) and no alternative is offered. It is merely a theory that says “the west is bad, and Conservative thought is bad”, and therefore they must be destroyed. And that message is repeated like a drumbeat through every means of communication the left control. Our schools, our universities, our mass media, our entertainment sources, our bureaucracies and our governments all repeat the message and it finally receives mass acceptance. And this is why we see ignorant school children (among others) who do not even know one real or truthful thing about Sarah Palin or Michelle Bachmann, writing intensely hateful messages to them and about them in social media. The process is underway where the seed is implanted and the innocent child who would otherwise grow to adulthood and aspire to normalcy, becomes the hate driven foot soldier for genocide. The left have whined loudly recently over “heated political rhetoric” from the right. This is an old communist ploy of course. To deny outright what is an obvious guilt and reflect the charge onto your accusers. There is no doubt that if there is a problem with hate today, it is because it is being deliberately and systematically injected into society’s veins by the left. Just look at the historical record if you doubt it. 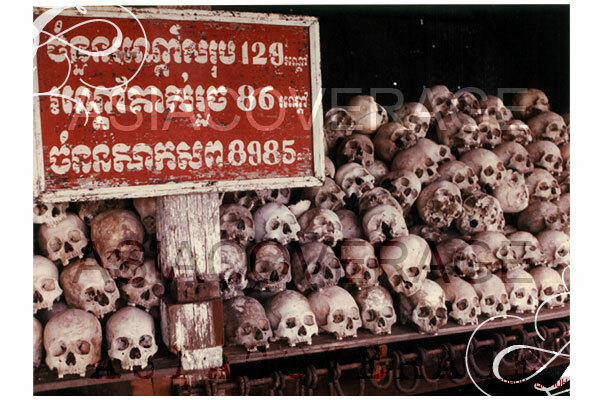 Count the skulls stacked in the Cambodian killing fields and there is the measure of what it can grow to if we do not stop it. After observing the irrational but deeply embedded Palin/ Conservative hatred expressed on Twitter and elsewhere, such as in the pages of leading newspapers and programming from broadcast television networks, I wonder if it is not too late already. Yes! and it is ‘too late already”–there are generations of these nascent thugs, just waiting for their violent and antisocial behaviour to be channeled into the purpose the governments of the day decide is expedient. The greens have already show the way, with that ad featuring exploding kids. Anybody who thinks this isn’t going to end in violent confrontation is dreaming. Correct- it is NOT a few extremist that drive the death camps- it is when an effective propaganda machine normalizes and even makes a virtue out of acts of violence. Then the nice chap next door that loves his garden and has polite kids will go along and help line the enemies of the state (and it’s always the state) next to an open pit. A lot of old film stock is coming out from WWII showing the mass executions in East Europe and it’s not a few vicious Nazi psychos and drunken Bulgarian auxiliaries doing the killing deep in the forests out of site. It’s ordinary troops doing what they consider to be their duty AND the local village turns out, one and all, to ENJOY what is a gala day out. Helped by the fact that the nice Germans let them keep the property of those deposed. Is it so much of a stretch to imagine that here?- the denizens of the state house areas having a laugh at the wealthy tory dogs being knocked on the head- followed by ransacking their upmarket homes for what the state has left behind. It’s only an extension of what goes on now. It is interesting that there is almost universal silence to the genocide that faced historic ethnic German communities behind the Iron Curtain when the communists swept all before them in 1945. Some genocide is acceptable to the left and easily ignored by the rest of us! Faa Oswald. You have to understand the times in context. German citizens took the brunt of Russian angst from the German invasion. There was a real reason behind Russian atrocities. They weren’t political or ieological atrocities. They were payback. They would have been seen as justice albeit warped justice. Just as the blacks took the brunt from the south as scapegoats for the civil war. Which the Lincoln tyranny full well knew they would. This is the start of genocide. And there are more waiting behind bars which the media is ignoring. … It was initially a mystery to me, for I was asking myself, how could this intense hatred grow, and how could it be so widespread. It had to be something systematic [systemic?] , but what was that system? … I thought about this and the recent widespread irrational expressions of hatred for Conservatives that were most apparent after the Arizona shootings. Red, while I agree that there is a political force behind it, I think there is something even MORE fundamental than this: I believe there is a SPIRITUAL force undergirding this fundamental change in peoples attitudes towards the Conservative Right – one which works through both those who are driving it, and those who follow behind. Those on the Conservative Right, as you pointed out, are usually those who embrace Judeo-Christian values and morality, and we both expect and encourage wider society to embrace those same values; and hold to account those who fail to do so – especially our leaders. We see the value in having people who embrace honesty, integrity, truthfulness, transperancy, purity, etc to lead us and be a general reflection of wider society and vice versa. But as we as a society have cast of our Judeo-Christian heritage, and especially the God behind it, then suddenly individuals within wider society no longer desire to be held accountable for their actions and choices. And those in leadership are no different. Of course the more “godless” have targetted those key leadership roles, and so we see a greater degree of godlessness within politics and their mouthpiece, the Main Stream Media. To deny outright what is an obvious guilt and reflect the charge onto your accusers. So rather than being seen as those who encourage morality and standards, we become a pariah; an anathema to the rest of society. And while ALL people of conservative values and political views are HATED, there are none MORE hated than those who are ALSO Fundamentalist Christians – they hate us almost as much as they hate the God we worship and who we view as our source of authority. Eph 6:12 For we wrestle not against flesh and blood [wordly authorities and individuals], but against [satanic spiritual forces:] principalities, against powers, against the rulers of the darkness of this world, against spiritual wickedness in high places. These “Dark Spiritual Powers” are demonic, and are behind, especially, all human government where God has been cast off. And just as Satan tried to usurp God from His heavenly throne, so too do his human agents here on earth try to usurp and remove from influence all those who stand for Righteousness; all those moral individuals and Fundamentalist Christians on the Conservative Right. So while “There absolutely has to be a political force behind it”, and there is, there is a satanic spiritual force undergirding this political force. These forces have declared war, spiritual and physical, upon both God and those who adhere to His values and standards; those same individuals who hold wider society, and especialy our political leaders to godly values and standards. This is so true. There is a huge conspiracy in America, Europe, Australia, and worldwide to turn the world into a Commie fiefdome, and the way they are going do it is by wiping out all True Americans who dont go along with there ideas. I don’t know what we can do about it. I would flee with my family if I could find another country that wasn’t already socialist but they all seem to have already fallen to the Commies. It might take many generations untill the World can be free again, unless the Lord comes back before then. Hey, I think this story fits in here right proper. The Left Thinks Killing Children Is Funny — Again! IOW, if there’s not enough room, she may to choose to send to the gas chambers one out of every two students. I wonder if the Liberals down there will think this is funny too. Wow guys, I was just thinking how people criticising Sarah ‘refudiate’ Palin is sorta like the genocide committed by the Khmer Rouge and Redbaiter thought of it first. Ahh OK, so Satan is making the kiddies act like the Khmer Rouge on Facebook now I get it. This reminds me of someone prefacing a remark with “I don’t mean to be racist but…”. Recognising other people may consider your comments crazy doesn’t make them any less crazy. And as if to prove a point along comes WOW. Seriously though we have found the disease so what is the cure?? Right Charmaine. It appears a nerve was struck. It is pointed out how — again — how the hard Left intimates evil actions in support of their goals, and then when challenged claims they meant to be funny, and then one of their useful idiots comes along and pokes fun at those whose core ethic is to fight evil and its personification. Oh, that’s right: ethics, not bowed to by the “tolerant” Left’s, are objects of scorn too. Split a gut laughing over that one willya Wow? Left and gauche and sinister — wow! Check out Max Keiser. He is curently in negotiatians with Iceland to make it a cheap freeland for those fleeing the US obliarchy. You pay some thousands to renounce your citizenship and become icelandic. They stand to make billions. Although this is already possible in the Bahama’s, iti s also way more expensive and the icelandic route will be far cheaper. It is of interest that the wealthy have already started their exodus from the US. If you email Keiser I’m sure he will bring you up to date on the situation. I am coming to believe that “the great tribulation” prophesied about in the Bible, and “the antichrist”, will be THIS system reaching its fulness. Extreme murderous ideologies are NEVER correctly identified as such until it is too late. Who thought, before the event, that Lenin or Hitler would murder millions? Why is it so fanciful, given the signs visible in the ideology, to suggest that the same kind of thing is building up to an even bloodier conclusion in blessed, civilised, orderly, decent countries all over the world today? Add to that, the “too many humans” ideology of the Greens and the Gore-ists……..
Yeah, that “10:10” (No pressure!) campaign typifies the true attitude of Leftist elite. … and yet how many noticed in the “10:10 Campaign” video that all, and I do mean ALL, of the people which were exploded were very WHITE? – not a brown or a beige one amongst them. I don’t know if others noticed this, but, as is usual, WHITE (and usually middle-class) people are painted as the enemy and invariably as those responsible for the latest ‘catastrophe’. Of course “white and middle-class” are symbols of the ‘evil’ Western Capitalist system – which too must be torn down and destroyed (according to Leftist elite). Thank’s for the info. I checked on Iceland and it says Iceland has “a Nordic welfare system providing universal health care and tertiary education for its citizens.” That just sounds like more Communism to me, like Obamacare, which we know is Comunistic. Every country I check on – like Australia, New Zealand, S. Africa, etc, and where I would like to live (not Sudan or India or someplace like that) is already 100% Commie or well on there way there, like Briton and Canada. I will check out Bahama’s to, but don’t have much hope. I’m afraid we will see the world become 100% Commie in our life times. If you want to find a good example of a modern-day ‘antichrist’ you need go no further than George Soros. This guy is evil incarnate! He is one of the key individuals who put Obama into power (among many other things). With respect I disagree. Communism is its own worst enemy. Look at the failed USSR, the states of the former Eastern Bloc. Whilst they are not very democratic, Communism is gone from those nations because Communism failed in them. When you have a system of command economics where x-volume of bread is available, but more is needed the shortfall simply does not get made up. You might not recall in the mid-late 1980s as Communism fell to bits in these countries, it led to massive food and fuel shortages exacerbated by corruption, poor – and failing infrastructure. This induced the velvet revolutions in Europe. Communism failed because Communism was going to eventually do so. It hasn’t done so in China because the regime has realised it needs a more open market, hence China’s double digit figure growth over the last several years. It is hanging on in North Korea because the people are simply too weak and cowed to do anything. Myanmar and Vietnam are also close enough to China’s borders that they are in its sphere of influence. I don’t think Communism is any closer to taking over the world, than Fascism is. Heaven forbid if either do. Communism–in Russia at least–hasn’t failed. It’s simply adapted in order to achieve the same ends by different means.